LOS ANGELES, CA--(Marketwired - Apr 28, 2014) - The Thalians, Hollywood's leading nonprofit organization dedicated to the treatment of mental health, raised $1 million Saturday night (4/26) at its annual gala. Rock 'n Roll Hall of Famer and multi-Grammy® Award winner Smokey Robinson was honored for a lifetime of entertainment and philanthropy with the Thalians' "Mr. Wonderful" award. The 56th annual gala, presented for the first time at House of Blues, on the Sunset Strip, was hosted by powerhouse philanthropists and event co-chairs Bob and Kira Lorsch. "We are thrilled with the event's success," says Kira Lorsch, RHL Group President. "This year's million dollar raise is a huge achievement for one of Hollywood's legendary charities now focusing on mental health and wellness programs for the wounded heroes of UCLA Operation Mend." International superstar (& new dad) Guy Sebastian, Operation Mend Soldiers, Gordy/Motown family members, and celebrities galore were all on hand for dazzling performances, a live auction and a sumptuous Whole Foods Market feast at House of Blues. Music Producer Rodney Jerkins (Beyoncé, Lady Gaga, Mariah Carey, Jennifer Lopez, Michael Jackson's "Escape" (release May 13th)) presented the award. Artists performing Smokey's songs included multi-platinum recording artist Guy Sebastian ("Battle Scars," "Like A Drum"-SONY), Taylor Dayne, "Cheech" with his wife Natasha Marin, Marilyn McCoo and Billy Davis, rock group Player, The Fifth Dimension's Florence LaRue, Joy Enriquez, AKNU from "THE X-FACTOR," Quinton Marcel and Bobby Arvon, all backed by musical director Todd Schroeder and The Thalians Orchestra. The Thalians, long led by entertainment legend and President Debbie Reynolds and Board Chair Ruta Lee, has raised over $30 million in support of mental health diseases. This year's event benefited UCLA Operation Mend, healing U.S. military men and women severely injured during service in Iraq and Afghanistan, mind body and spirit. For additional information, please visit http://www.Thalians.org. The Thalians selects its honorees for their contributions to the entertainment industry and personal philanthropy. The Mr./Ms. Wonderful award was personally created and designed for The Thalians by Walt Disney himself and has become a most sought after celebrity award. 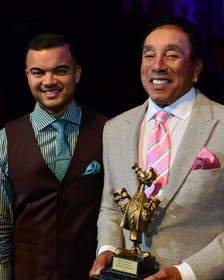 Smokey Robinson joins the illustrious list of Thalians' honorees including: Frank Sinatra, Shirley MacLaine, Gene Kelly, Lucille Ball, Carol Burnett, Sammy Davis Jr., Debbie Reynolds, Bing Crosby, Bob Hope, James Stewart, Whoopi Goldberg, Sally Field, Mary Tyler Moore, Burt Bacharach, Sir Roger Moore, Clint Eastwood, Mickey Rooney and Hugh M. Hefner. The Thalians' focus is now the mental health and well-being of America's wounded heroes.